Hal Leonard is proud to present this dynamic new Christmas offering created by Lowell Alexander and arranged and orchestrated by Robert Sterling. Every one of the songs is full of emotion, as each one contains the word joy. 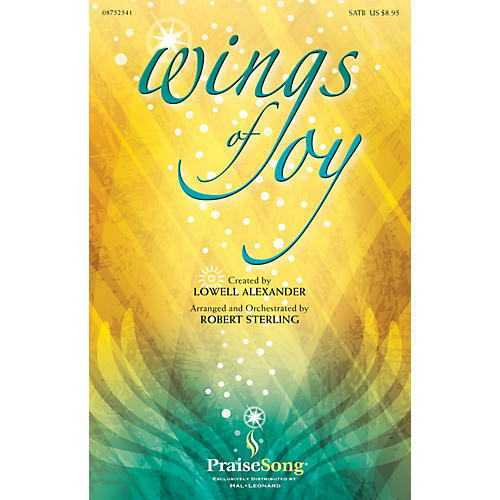 From moments of high, joyous praise to quiet, meditative times of reflection, this work will provide a truly fresh and unique worship experience for your choir and congregation. Available separately: SATB, Preview CD, ChoirTrax CD (Split Trax), ChoirTrax CD (Stereo), Preview CD Pak, Preview CD 10 Pak, RehearsalTrax CD, Video Accompaniment DVD, Video Accompaniment DVD (with click track). Score and Parts available on CD-ROM (fl 1-2, ob, cl, hn 1-3 [asx], tpt 1-3, tbn 1-2 [tsx], tbn 3, tbn 4/tba, glock, tblr bls, perc, timp, rhythm, dm, hp, vn 1-2, va, vc, db [bcl], kbstr). Duration: ca. 33:30.